A crown could be a good solution for you if you have some discoloured fillings and want a more aesthetic smile. 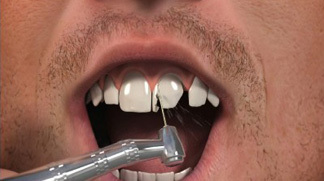 The crown fits over the remaining part of a prepared tooth, making it strong and giving it the shape of a natural tooth. It will also be tooth coloured, giving the restoration a more natural appearance so it fits in with the rest of your teeth. Also, if you have had root canal treatment you may need a crown to protect or cap the restored tooth, allowing you to eat and bite down on it as if it was a real tooth. Crowns are also used to anchor a bridge or denture firmly in place in the mouth. Once I had decided to go ahead, with having 10 new upper crowns; I discussed with the whole procedure with Dr Dixit. We decided on the shape and the new colour, of the crowns to be fitted. He informed me of any problems that may occur, wither during the preparation procedure or after the crowns had been fitted. I worried about the day that I would have the preparation work carried out on my teeth. On the day, the work on my teeth lasted for quite a few hours and although the procedure was uncomfortable it was not painful. Even though I also had some old metal crowns removed at the same time. Dr Dixit spent time, making me some temporary teeth, that looked excellent and I was very happy to wear them for 2 weeks, whilst the new crowns were being made. I had the new crowns fitted 6 weeks ago and I am very happy with the result and have had no problems! Nishan made me feel very comfortable before and during the treatment. He spent a lot of time and effort making sure that everything was perfect, from the shape of my teeth to the size and colour. I am extremely happy with my new smile and the comments that I have received has boosted my confidence even further.